WOW Fantasy Worm Escape is another point & click escape game developed by WOWEscape. In this fantasy escape game, you came to a Fantasy Worm forest. By finding useful objects, hints and solving the puzzlea you need to find out the Magic leaf in this forest. Good Luck and have fun! nice....3x3 had me for a min. 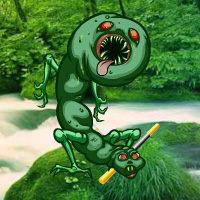 If this worm is your fantasy, please talk to someone. Otherwise, good game - nice and logical. Man, that worm is UGLY as sin...lol! If you don't like this worm. do NOT EVER watch the movie "The Langoliers".